Italian-inspired Californian coastal cuisine in one of Santa Barbara’s best settings. Breakfast Mon.-Fri., Lunch Mon.-Fri., Sun., Dinner Wed.-Sun., Brunch Sat.-Sun. : Bella Vista thrives on the California coast, making use of regional seafood as well as produce from local farmers markets and the on-site garden at the Four Seasons Biltmore. For sheer ambience, the outdoor patio with views to the ocean and Channel Islands is unbeatable. The sedate interior has a pleasant Moroccan feel. Starters include a Santa Barbara harbor seafood platter with a half lobster tail, oysters, king crab legs, tuna poke and prawns. Move on to fresh house-made pastas and main dishes such as chicken alla diavola or dry-aged New York steak with chimichurri. End on a sweet note with the gelato or chocolate hazelnut cake. 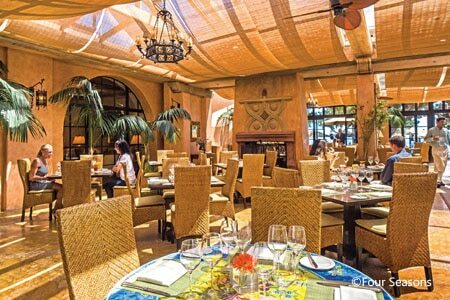 The Sunday brunch buffet is one of the most extensive in Santa Barbara. Service is reliably professional.